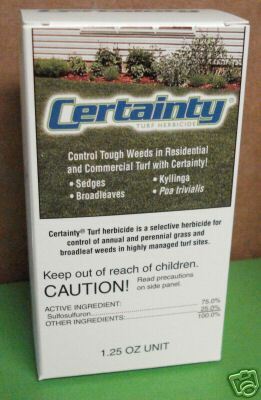 Certainty by Monsanto is a selective herbicide for turf and can be used on annual grass, broadleaf weeds, and perennial grass, even in highly managed turf sites! Certainty van be used as a pre-emergence or post-emergence systemic herbicide! Using the active ingredient Sulfosulfuron, Certainty herbicide will control many annual and perennial sedges, grass and broadleaf weeds in sod farms, highly managed turf and native grasses sites. 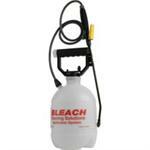 This product MUST be used with an herbicidal surfectant for ideal results! 1 of these 1.25oz Packages will cover 1000 sq. ft! Would you like to see the Certainty Turf Herbicide Label? How about the Certainty Turf Herbicide MSDS sheet?